Description: This set of nine beads is made up of two small rounds, five crystal shapes, and two "diamonds". 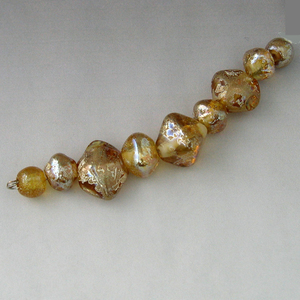 Just two things were used in making these beads — clear glass and fine silver foil. A particular clear glass that turns fine silver foil golden is required to get this golden glow.